ABSTRACT: Abundant and diverse polycystine radiolarian faunas from ODP Leg 181, Site 1123 (0-1.2 Ma at ~21 kyr resolution) and Site 1124 (0-0.6 Ma, ~5 kyr resolution, with a disconformity between 0.42-0.22 Ma) have been used to infer Pleistocene-Holocene paleoceanographic changes north of the Subtropical Front (STF), offshore eastern New Zealand, southwest Pacifi c. The abundance of warm-water taxa relative to cool-water taxa was used to determine a radiolarian paleotemperature index, the Subtropical (ST) Index. ST Index variations show strong covariance with benthic foraminifera oxygen isotope records from Site 1123 and exhibit similar patterns through Glacial-Interglacial (G-I) cycles of marine isotope stages (MIS)15-1. At Site 1123, warm-water taxa peak in abundance during Interglacials (reaching ~8% of the total fauna). Within Glacials cool-water taxa increase to ~15% (MIS2) of the fauna. 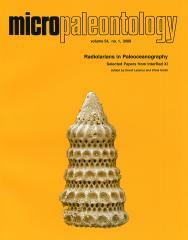 Changes in radiolarian assemblages at Site 1124 indicate similar but much better resolved trends through MIS15-12 and 7-1. Pronounced increases in warm-water taxa occur at the onset of Interglacials (reaching ~15% of the fauna), whereas the abundance of cool-water taxa increases in Glacials peaking in MIS2 (~17% of the fauna). Overall warmer conditions at Site 1124 during the last 600 kyrs indicate sustained infl uence of the subtropical, warm East Cape Current (ECC). During Interglacials radiolarian assemblages suggest an increase in marine productivity at both sites which might be due to predominance of micronutrient-rich Subtropical Water. At Site 1123, an increased abundance of deep-dwelling taxa in MIS 13 and 9 suggests enhanced vertical mixing. During Glacials, reduced vigour of ECC fl ow combined with northward expansion of cool, micronutrient-poor Subantarctic Water occurs. Only at Site 1123 there is evidence of a longitudinal shift of the STF, reaching as far north as 41°S.